PAST&E Tennis, Dancing, Fitness and Nutrition! Portland After-School Tennis & Education is a non-profit youth development organization in Portland, Oregon. Through one-on-one tutoring, tennis lessons, direct instruction, a strong emphasis on nutrition and fitness, and parent education our program develops strong scholar athletes and prepares them for a productive future. 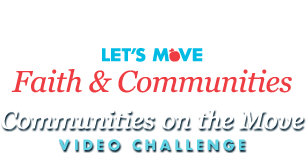 We are excited to share our Let's Move Faith and Communities, Communities on the Move Video Challenge video with you! Watch our dances and fun fitness activities and please vote for our video! Way to go PAST & E.
Who ever thought getting "fit" could look like so much fun! Come on America...Let's Move It!! I'm so proud of you guys, everybody looks so adorable!